Jayme’s Fund had a special invitation to do a project with the students at Northwest Elementary School in Manchester, New Hampshire on Thursday, May 19th, 2016. Caren Rifkin, the founder of Jayme’s Fund for Social Justice, and Melanie Friese, the administrative assistant, went to Mrs. Barry’s third grade class to teach students about helping others and giving back to their local community by participating in the Jayme’s Bears Project. 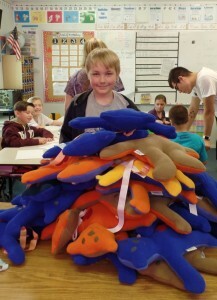 Look at the pile of Jayme’s bears that the Northwest Elementary students stuffed! 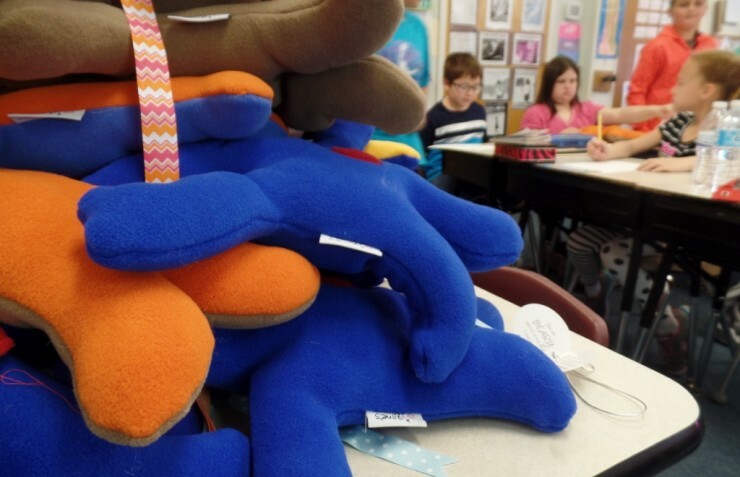 The students stuffed 25 Jayme’s bears to give to children in need. With their small hands, the students stuffed the bears quickly and could get the stuffing all the way into the bears’ little arms and legs. Many of them wanted to stuff more than one bear! The invitation for Jayme’s Fund to come to Mrs. Barry’s class was inspired by one of her students. The student asked the class’s intern from City Year, Anthony Cerasi, if they could do something to help other children in Manchester. Anthony had attended a Jayme’s Bears Project event at his alma mater, Southern New Hampshire University, so he immediately thought about having the students stuff bears. The student was very happy to be involved in the project, and that Jayme’s Fund came to his class. He said that he loved the event, and was happy that they could do something to help other children. The student also said that he wants the bears to go to Child and Family Services in Manchester. 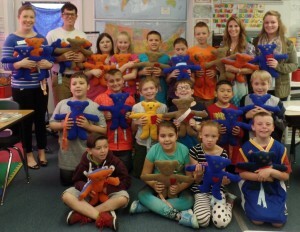 Mrs. Barry’s class and volunteers each holding the bear they stuffed! 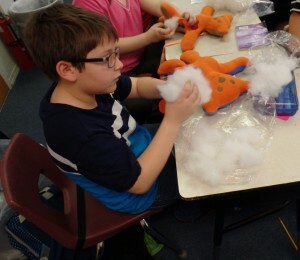 Northwest Elementary student working hard to stuff his second bear! This was Jayme’s Fund’s first visit to a third grade class for the Jayme’s Bears Project. (Our youngest bear stuffers). The students loved stuffing the bears and Mrs. Barry suggested that Jayme’s Fund could put together the event for all of the third graders at Northwest Elementary next school year. Now, then the kids could make even more Jayme’s bears and make a greater impact! At Jayme’s Fund, we are so inspired by children wanting to make a difference in the world and we are passionate about doing what we can to help them do that. The Jayme’s Fund project is one of our programs that helps children get involved. The third grade students really understood the value of their work that day and that was very rewarding to be a part of. If you are interested in the Jayme’s Bears Project, please contact us at info@jaymesfund.org.